Some of the places we’ve been include: Buffalo Wild Wings, Dow, Dow Corning, Music in the Parks, Great Lakes Loons, Epilepsy Foundation, Saginaw Valley Ford, Frankenmuth River Place, Hank Graff Chevrolet, Central Michigan University, Mott Community College, Radisson Hotel Piscataway, Embassy Suites, Martin Funeral Home, Tuscola Co. Medical Center, St. Timothy Lutheran Church, Dental Care Team, Flint Institute of Music, U Pick Blueberry Farm, Empowered Zone Collation. 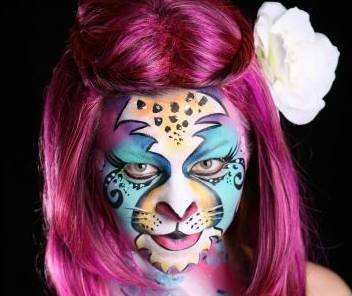 High quality face art! Specializing in toddlers to teens and professionally trained. We only use high quality FDA approved products that are made for cosmetic use. Washes off with mild soap and water and is gentle for your skin. We have a large variety of designs, and will determine which designs are offered from amount of time and guests . 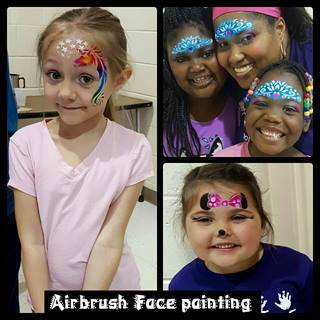 You can’t find higher quality face painting! Great for all ages from toddler to teen and adult parties. Airbrush Tattoos are something the whole family can enjoy. Even Grandma and Grandpa love them. We have a large variety of designs, last up to 7 days depending on your skin type. Also what kind of care you give them. Removes easily with alcohol or baby oil. We have water base paint that you can enjoy for the day. Washes off with mild soap and water. Michigan Airbrush tattoos at its best. Balloons are great fun by themselves – or ask about are party specials where you get balloons, and your choice of face painting or airbrush tattoos. Michigan Ballon Twisting at its finest!